Muslim cab drivers have walked off the job in Cleveland, Ohio rather than drive taxis with advertising for the Gay Games, which will take place there in August. According to 19 Action News reporter Brian Duffy who spoke with about 20 cabbies at the airport who are still driving and all of them confirmed there are drivers who have walked off the job on protest. Representatives of AmeriCab, one of the three cab companies on the job at the airport, also confirmed the protest but say only one of their drivers has been reassigned. We’re told at least 16-17 drivers who work for Ace Taxi, another company working out of the airport, are no longer driving. We went to Ace but were told they were too busy to talk to us. Yellow Cab, a third cab company at the airport, never returned our calls. Tom Nobbe, the executive director of the games, says he’s a bit disappointed. “When you look at what’s going on around the world it’s not a huge surprise. 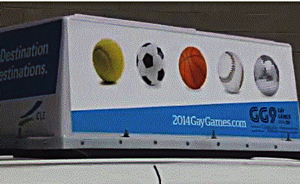 In some parts of the world LGBT folks are not very welcome,” said Tom Nobbe of the Gay Games. I can’t wait to watch Matt Barber, Tony Perkins, Linda Harvey and the rest of The Bigot Bunch go out of their way to defend the rights of Muslims. Supergirl (Vol.4) #79 – Superman Exposed To PINK Kryptonite Turns GAY! Thats fine….its a free country…something they can’t say about where they come from. I’ve been out of work for a year, maybe I’ll move to Cleveland and apply for there job.